India's largest e-commerce venture Flipkart is mulling over launching physical stores in smaller cities to attract more customers. Under its new project that it internally calls 'assisted commerce', Flipkart wants to cement its position as the preferred online retailer even in the remote cities of the country through planned brick-and-mortar stores, to double its user base, according to a report published by Mint. The development comes in the wake of Amazon India accelerating its offline play by forming a partnership with LocalCube Commerce Pvt. Ltd, which runs an assisted e-commerce platform under the StoreKing brand, for rural customers to shop. StoreKing partners with retail store owners in small towns to provide self-service shopping experience to rural shoppers via its digital kiosks. Similarly, Flipkart's physical stores will target the remote regions of the country where internet penetration is low, speed is abysmally slow, and where ecommerce is yet to be established as a regular practice. Flipkart's engineering chief Ravi Garikipati confirmed the development to Mint, but said its online-to-offline (O2O) plans are at an early stage currently and it could be reshaped at any point in future. In July last year, the company had revealed its plans to open offline collection centres across the country to allow its customers to pick up their orders. "Our efforts are focused on expanding our delivery network without compromising on the customer service levels and expectation," Neeraj Aggarwal, senior director (delivery operations), Flipkart had said then. 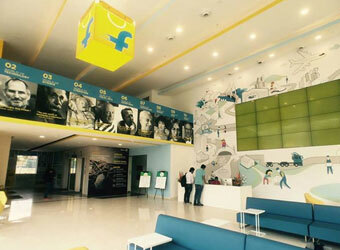 The 'experience zones', as Flipkart named it, were to be launched in conjunction with its logistic arm eKart. These centres were supposed to offer value-added services such as assisted buying, spot trials, open box deliveries, cash on returns, instant returns and so on. However, the company doesn't seem to have made any headway on this proposed project. Meanwhile, Flipkart's biggest rival Amazon has been operating an offline shopping project named Udaan since 2014. It inked a partnership with rural ecommerce firm StoreKing, which has more than 10,000 rural outlets across south India. Amazon added 1,000 more outlets as part of its Udaan initiative. Under this project, Amazon trains local entrepreneurs in small towns, cities and in certain urban areas with poor internet connectivity. While local entrepreneurs persuade consumers to buy products, Amazon delivers the products with the entrepreneurs taking a cut from the transaction. As online retail sales continue to fall, many digital commerce companies are looking at offline stores as a way to improve sales. According to research firm RedSeer Consulting, online retail sales decreased to an annualised $12 billion in June compared with $15 billion in December last year. "Going forward, especially in India, pure play ecommerce model will take a long time to become profitable. It should reach a scale. Until then we should be patient. The only model which can become sustainable and profitable is the omni-channel model because 90% of the market still remains offline. You have to provide solutions to the offline world as well," FirstCry founder Supam Maheshwari told Techcircle in a recent interview. According to a recent report by The Wall Street Journal (WSJ), Amazon is planning offline grocery stores across the country to introduce curbside pickup locations, which means that customers can order through the website or app and can collect it when it's ready to be picked. Amazon is planning to build brick-and-mortar stores that will sell food items such as milk, meat and other perishable products. Known as Project Como, these offline stores "are designed to capture the large share of people who prefer to pick out their produce or bring home their groceries on the way from work," the report said. Private label fashion e-tailer Yepme.com had changed its strategy from being just an online player to launch offline stores early this year. The company wants to establish about 1,400 outlets over the next three years as it eyes to generate 75% of its revenue from its offline business. Techcircle.in also had reported in September about online hyperlocal grocery startup Zapmart's plans to set up brick-and-mortar stores. Zapmart founder Parvez Siddiqui said physical stores will be part of an omni-channel strategy and help attract consumers who prefer to touch and feel products before buying. A number of offline players, especially in the fashion segment, operate on an online-offline model to transition into profitability.